Optimum ZMA capsules help you get the sleep and rest you need to recover from your workouts and busy life.Unlike melatonin and other sleep aids ZMA does not leave you feeling hungover the next day. Instead you’ll feel rested and ready. 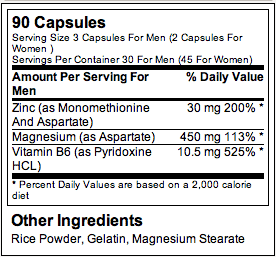 Every capsule contains 3 ingredients: magnesium aspartate, zinc aspartate, and vitamin B6. No more, no less. What makes Optimum ZMA better than other products is the type of magnesium and zinc used. They are better absorbed than other brands to ensure they work optimally for you. Here’s a breakdown of how each ingredient helps you. Magnesium Aspartate – relaxes so you get a good night’s sleep. Zinc Aspartate – keeps your immune and hormonal systems strong so you can stay healthy and training hard. Vitamin B6 – replaces what you lose working out. Play a key role in the muscle building and repair processes. How Else Can Optimum ZMA Help Me? By ensuring you get these key vitamins and minerals that will help you sleep and recover faster many areas of your health can improve. Lose or keep weight off easier. Performing your best in and out of the gym. Is it safe for men and women? Yes, healthy men and women can take it without any negative side effects. The only difference is men take 3 capsules per serving and women. As with any supplement, you should check with your doctor before taking ZMA to make sure it’s safe for you. 2. How long will a bottle last? Each 90 capsule bottle contains 30 servings for men and 45 for women. You’ll take 1 serving a day. 3. Should I take ZMA on an empty stomach? You probably should. Not necessarily because of the ingredients but since eating right before bed can make it difficult to fall asleep. 4. How long does it take to see results? You should see benefits the first time you take ZMA. Men: Take 3 capsules, preferably on an empty stomach, before bed. Women: Take 2 capsules, preferably on an empty stomach, before bed. Warnings: Keep out of reach of children. Check with a qualified healthcare professional before using this product if you are pregnant, nursing a baby, under 18 years of age, or if you have any known or suspected medical condition(s) and/or are taking any prescription or OTC medication(s). Be the first to review “Optimum Nutrition ZMA – 90 Capsules” Click here to cancel reply.